I often find myself in a bit of a pickle when I have to make a decision that is susceptible to impact my life one way or another. In this context, I can assure you that the common advice to “trust one’s gut” is quite nonsensical to a generally anxious person. Trust my gut, you say? Alright then, I guess I’ll just be on my way back to my comfort zone, far away from this decision-making madness! Having to decide on something makes a lot of people feel uncomfortable, whether they’re anxious or not. Decision-making often brings about change, which even the non-anxious humans dislike by default. Our brains like comfort, habits and everything else that’s taking place within our beloved comfort zone. Change is scary − it’s new and different and overall gives us the feeling of having to leave a warm and fuzzy bed on an early winter morning. I both love and hate change. I sometimes need it really badly but at the same time it scares the sh*t out of me. I usually feel quite excited about making a change-causing decision for a hot minute and then I immediately plummet into a spiral of regrets because I get really scared, to the point that I end up wishing I had decided differently. I love this. It’s true that people, including me, often mistake courageous people for being fearless. It indeed takes courage to make the decision to change, even if that’s a scary thing. Now imagine what life’s like for an anxious person who experiences fear in all its glory on numerous occasions throughout most regular days which don’t even require making any life-changing decisions. A non-anxious person may think that most of these scenarios aren’t fear-inducing at all and that it’s completely ridiculous to be afraid of them, and I’m not even going to argue with that point of view because I know all that. However, despite all efforts to rationalise (both from others and the anxious people themselves), anxiety doesn’t care. It’s not rational. It sticks around anyway, rearing its ugly head in all kinds of situations you wouldn’t even expect it to. If you take the above and the fact that “courage is fear walking” into consideration, you’ll notice that anxious people need a lot more courage than those who aren’t anxious, considering they feel afraid far more frequently. You might not always realise they’re struggling though, because a lot of anxious people are high-functioning, meaning that they function reasonably well in their everyday lives, so much so that nobody has a clue about what’s actually going on behind their smile [click here if you want to know more about high-functioning anxiety]. On a slightly different note, it also requires courage to stand up for what we believe in, even if no one in the room is on our side. This is true for both anxious and non-anxious people, but it’s obviously more challenging for the former. I’m a sucker for truthfulness and authenticity and I often find myself drawn to people who can stand up for themselves and totally own it. Personally, I struggle with knowing what I want and consequently with standing up for myself in stress-inducing situations. I’m torn between all kinds of conflicting advice that’s buzzing around in my mind, screaming for attention. Be open-minded! Be picky! Trust your gut! Don’t settle for less! Be understanding! Stand up for what you believe in! Tell the truth! Don’t hurt people’s feelings! Seriously, how am I supposed to put all this into practice and know what I want while my subconscious mind is busy plotting to get the f*ck out (GTFO) of there?! When I find myself in an anxiety-inducing situation, it can be difficult to remember who I am and what I stand for. 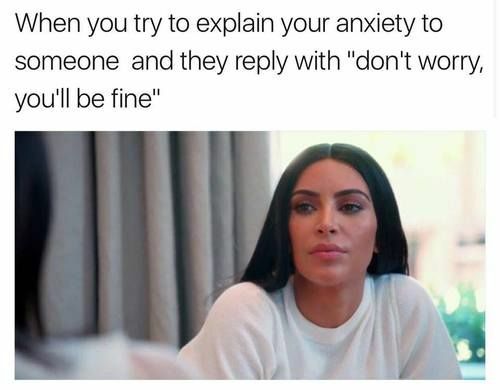 Anxiety can be like an earthquake making everything that is me crumble into pieces − I’m actually pretty sure I wouldn’t even be able to remember my own name in such a moment. It’s usually only after I get out of the stressful situation that I manage to put myself back together, bit by bit, reassembling the pieces of me and remembering what I want. The duration of this process obviously depends on the scale of what caused me to lose myself in a spiral of self-doubt in the first place. When I’m afraid, my main instinct is to run. My brain is looking for a way to flee any uncomfortable situation as fast as possible. My gut is telling me to GTFO, so “trusting my gut” isn’t much of a solution. Since the level of my discomfort is usually higher than the one any non-anxious person would experience in the exact same scenario, I’m also not always sure for how long I’m supposed to “endure” a given situation before it is legitimate to GTFO. This explains why I often stay for too long, having missed my GTFO window [click here if you want to read about my bullsh*t tolerance, which is directly linked to me not being sure of when to walk away]. Whenever I manage to stand up for myself and the things I believe in right away, a little bit of self-doubt keeps lingering on. The reason for this is that it can be difficult to determine whether I stood up for myself for all the right reasons or whether I did so because of general discomfort and/or anxiety. Of course that is only the case when standing up for myself consequently gets me out of the situation. The easy way out, so to speak. I can’t help but wonder if all of the above even makes sense to someone who doesn’t know what it feels like to be anxious. If you’re one of the lucky bastards who doesn’t understand what the heck I’m talking about, I hope that it’s at least puzzling enough to shed a bit of light onto the fact that not all people are the same and that some of us have a very busy mind, causing worries and fears that others wouldn’t even dream of having.